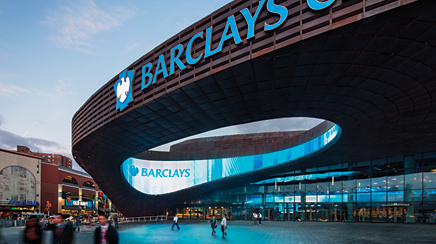 Leveraging Brooklyn's heritage and a celebrity superstar, the Barclays Center shoots and scores with effective comms. If it is 3:14pm in London, it is 6:14pm in Moscow, and 10:14am in Brooklyn, New York. It might be difficult to understand how those points in time connect, but if you are in the corporate offices of the Barclays Center and the Brooklyn Nets those time zones perfectly align over the MetroTech Center. Barclays, a British multinational banking and financial services company, has its headquarters in London and the Nets are owned by Russian billionaire Mikhail Prokhorov. But make no mistake, everything else in the reception area, including large poster-size historical images of Brooklyn and coffee table books celebrating the region's history, reminds you that your feet are firmly planted in downtown Brooklyn, which despite being a borough of New York is often touted as the fourth largest city in the country by population. The offices are about a mile away from the Barclays Center and Atlantic Yards, a $4.9 billion project that will develop 22 acres in Brooklyn incorporating 6 million square feet of residential space, almost 600,00 square feet of office and retail space, and eight acres of open space for the public. There is a lot of activity this morning; the phone doesn't stay quiet for long. “Good morning, corporate office of the Barclays Center and the Brooklyn Nets. How can I help you?” says the receptionist. “No, I'm sorry. He doesn't work for the Barclays Center or the Nets. Yes, he is here for meetings, but no he doesn't work in this building.” The receptionist is very patient. It's not the first time someone has called to speak to Brooklyn native Jay-Z, the celebrity hip-hop mogul who is a part owner of the team. The arrival of the Brooklyn Nets in November 2012 ended a 55-year drought for a major sports team in the borough. While his financial investment is relatively small, Jay-Z has generated a lot of PR buzz with his hands-on approach, participating in press conferences, famously kicking off the opening of the center with a series of sold-out concerts, and helping design the uniforms, logo, and brand identity for the new-look Nets. The story that leads up to the building of the center began almost 10 years ago. Bruce Ratner, chairman and CEO of Forest City Ratner Companies, shared his vision of buying the then New Jersey Nets and moving them to a new arena he was going to build in downtown Brooklyn with DKC agency head Dan Klores. It would be the largest development project in the borough's history. Part of the agency team assigned to work on the project was Barry Baum, who as a kid growing up in Brooklyn was rarely without a basketball in his hand. He was a ballboy for the New York Knicks and later a sports writer for the New York Post. Ratner subsequently hired Baum from DKC to work with Forest City Ratner, the Nets, and Barclays Center at the end of 2004 after the sale of the team had gone through. And while there was a full court press on for promoting the high-profile plans for Brooklyn and the new 19,000-seat arena, the organization still had to sell tickets in New Jersey for a struggling team with a 2009-2010 season of 12 wins and 70 losses that was not drawing a lot of fans. “I spent a lot of time promoting unique initiatives,” explains Baum with a smile. He was recently promoted to CCO of the Barclays Center and the Nets. Baum moved beyond typical promotions such as free hot dogs and foam fingers, instead partnering with a tax preparation company that set up a table at a Nets game and offered fans the chance to have their taxes done for free. “It got a ton of national attention,” he adds. “We tried to be different and think outside the box.” Attendance for Nets games at the Barclays Center was up by about 3,000 through game four compared to last year. The organization also had to contend with considerable skepticism surrounding the project. Brooklyn hadn't had a team since 1957 when the Dodgers left for the West Coast. There were concerns over traffic congestion, displacing residents, and Forest City Ratner needed to rethink some elements of the project when faced with the recession. Changes included swapping out original architect Frank Gehry with Shop Architects and Aecom. And every change necessitated proactive messaging. “Over nine years there were 35 different suits brought against us,” adds Baum. “A lot of people in the community were against the project. That's no secret. There were a lot of steps over the last nine years that were challenging.” Forest City Ratner was successful in 34 out of 35 suits. On the communications and PR front it was game on. Internally the team needed all its skills and confidence to overcome some tough opponents and that inspiration came from Ratner himself. Brooklyn native and Nets part owner Jay-Z kicked off the arena's opening with several sold-out concerts. Baum, who reports to Barclays Center and Brooklyn Nets CEO Brett Yormark, handles business, entertainment, and community communications for the arena and the team. Up until March 2012, he was a one-man comms operation until communications manager Mandy Gutmann was hired. He works closely with DePlasco, Forest City Ratner executives including Ashley Cotton, VP of external affairs, and the NBA's SVP of marketing communications Mike Bass. Early on, campaigns created a rallying cry around bring-ing a home team back to Brooklyn and focused messaging and activities around jobs, housing, and hoops. Players attended community events and spoke at schools. The arena entered into a community benefits agreement, a legal document that promises jobs and housing. Mayor Michael Bloomberg and developer Bruce Ratner cut the ribbon on the new Barclays Center on September 21. Nineteen hundred of the jobs generated by the center are part time, with 100 full-time positions. The arena partnered with the New York City Housing Authority, churches, and local small agencies to recruit area residents for the jobs, later publicizing the positions on a more wide-scale basis and attracting 35,000 applicants. Fans at events can chow down on food from local vendors including hot dog icon Nathan's, as well as Fatty ‘Cue, the Red Hook Lobster Pound, and cheesecake legend Junior's. Finalizing the food roster under the banner Brooklyn Taste took about a year. Fans inside the Barclays Center can purchase Brooklyn Nets merchandise and have access to a variety of local food vendors. Baum arranged for a Times reporter to meet Ratner, but the icing on the black-and-white cookie from Beigel's was when Baum arranged for the reporter and Ratner to be escorted around the entire concession concourse with the vendors open, owners standing outside their restaurants, and staff on hand to serve. The tasting tour was a three pointer in media relations. The New York Times ran the story online first on September 21 to coincide with the arena's opening, ran in print on September 26 on the first page of the dining section, and again online the same day. Performance is key off the court as well as on. Baum and a marketing team of about six have a steady stream of opportunities to promote. A stage was built in front of the center where the public watched boxers weigh in to promote bouts. The New York Islanders announced in October that they will play hockey at the center begin-ning in 2015 and the center will host a number of artists ranging from Lady Gaga to opera star Andrea Bocelli. And the Barclays Center is only the first phase of what is a massive project planned for the area. There will be a ground breaking for the first 32-story residential building on December 18. Phase one includes the Barclays Center and five other buildings. Phase Two includes 11 residential buildings, eight acres of open space, and retail.